Transfers all data like notes, contacts, photos, etc. between devices. Supports all Android and iDevice models. 60 seconds to complete the transfer with ease. 0 possibility of data loss or hacking during the transfer. Have you been using your iPhone 4 since forever and thinking of getting a shiny new Android phone? 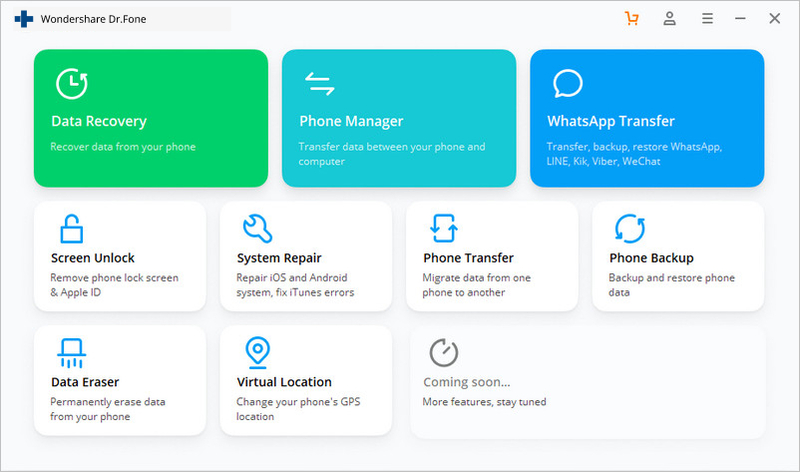 You are finally ready to switch from an iOS to Android and it will definitely give you a different smartphone experience. It can be an exciting transition, but you should know that this process may frustrate you. While Android devices support SD card for easy data transfer, iPhones do not have this capability. 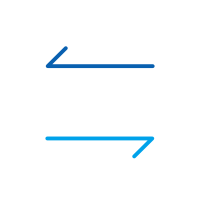 Furthermore, since both operating systems have different programming structure, there is no way to directly transfer data via a simple USB cable or Bluetooth transfer. So, if you are looking to transfer notes from iPhone to Android, we have you covered with this article. You can also use these methods for other important data. So do check these steps so that you can start moving your data now and experience your new Android phone. Transfer Notes from iPhone to Android in 1 Click! 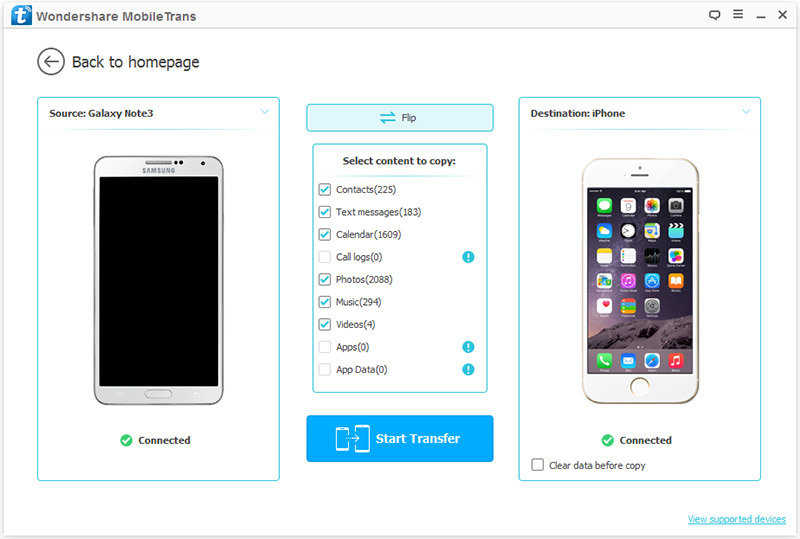 Easily transfer photos, videos, calendar, contacts, messages and music from iPhone to Android. Note: If you have no computer, you can get the dr.fone - Switch (mobile version) from Google Play. 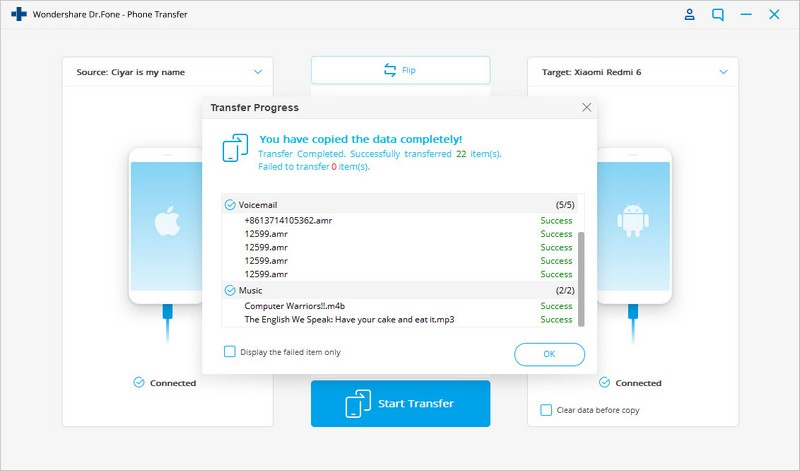 After installing this Android app, you can download iCloud data to your Android directly, or connect iPhone to Android for data transfer using an iPhone-to-Android adapter. Step 1. Launch dr.fone and select "Switch"
Run dr.fone and connect your Android phone and iPhone to your computer. Select the "Switch" mode in the below window. You can use the "Flip" button to switch the places of your phones and make sure that the Android phone is the destination one. Check the contents box you'd like to transfer, here if you'd like to transfer iPhone note to Android, you can just select "Notes". 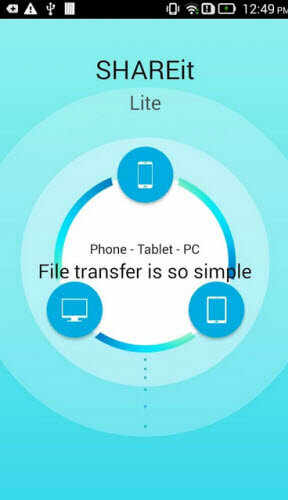 And then click "Start Transfer" to initiate the process of data transfer from iPhone to Android phone. After then, it will take a few minutes for the program to transfer notes from iPhone to Android. If you do not have a Gmail account, but do have an Outlook account, you can start emailing your notes. However, if you have plenty of them on your iPhone, this is just impractical. Connect you iPhone to your computer using a USB cable. Launch iTunes on your desktop. On iTunes, click Info located in the Summary Panel. Check Sync notes with... and choose Outlook from the drop-down menu. 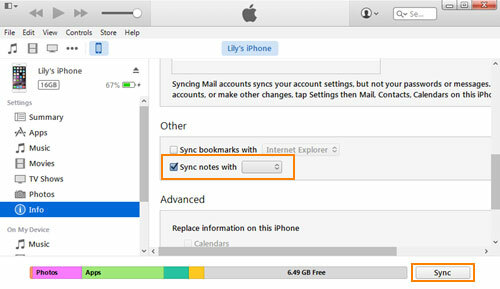 Click Sync to initiate the syncing process between iPhone notes and Outlook. Depending on the amount of notes available on your iPhone, the syncing time varies. On your Android phone, configure your Outlook account. Once the process is completed, you are able to find the notes inside the Reminders folder in your Outlook application. 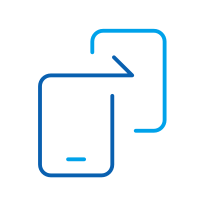 Note: If you cannot find your notes on your Android phone, you will be able to download the notes onto your computer from your Outlook account. Once the download is complete, you can upload the notes on your Android computer via a USB cable or SD card. 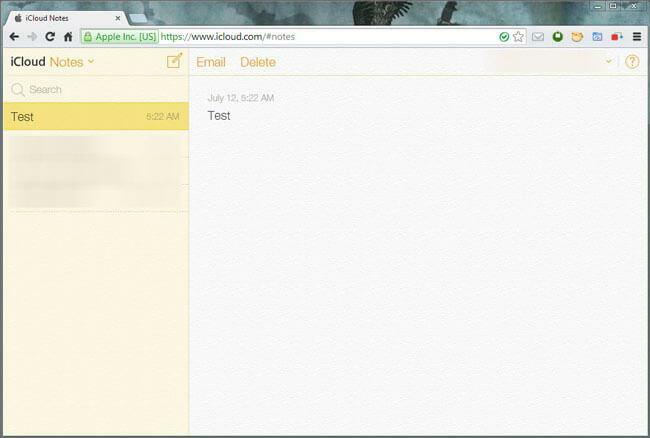 iCloud is probably the safest method to transfer your notes between devices and different platforms. The beauty of cloud storage is that it is accessible on any device and platform. Its accessibility also means that you can do the transfer anywhere and anytime - if you are not sure about doing it yourself, you can always ask a trusted friend to help you transfer you notes at his/her place. 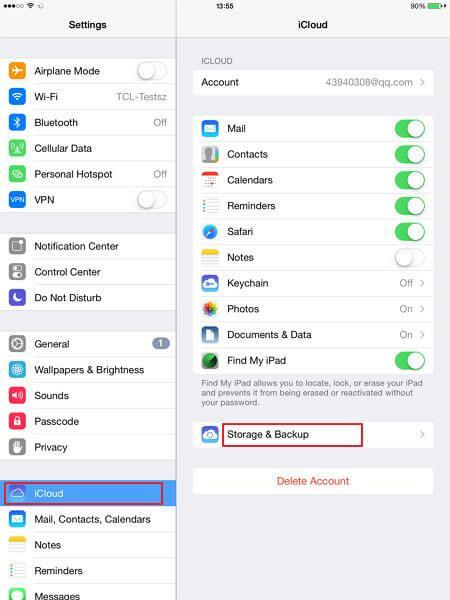 On your iPhone, go to Settings > iCloud and make sure you turn iCloud sync with Notes. Tap on Storage & Backup > Backup Nowto start backing up Notes from your iPhone or iPhone. On your computer, access your iCloud account. You will be able to see the notes that you have sync with your iPhone. To transfer it to your Android phone, email the notes that you want to yourself and download it straight on your android device. 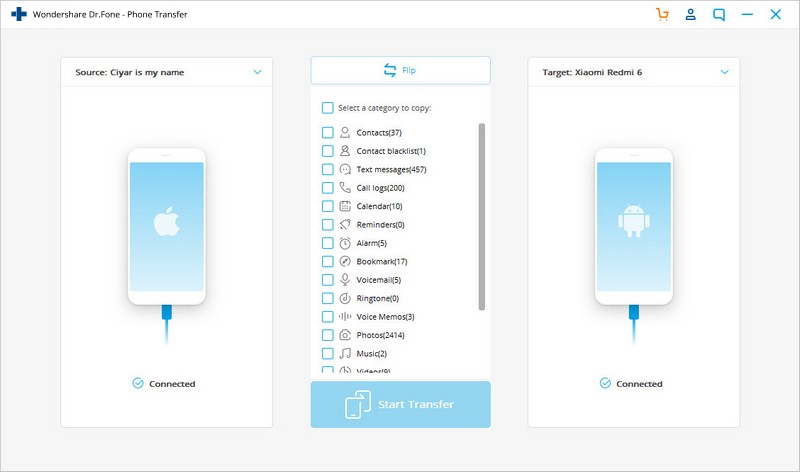 This is a great way to not only transfer notes from iPhone to Android, but also to make sure you back them up so that you will be able to access them in the future in case you need to restore them in any circumstance. Many of us are probably Google users so this would probably the easiest way to transfer iPhone Notes between your old and new phones. 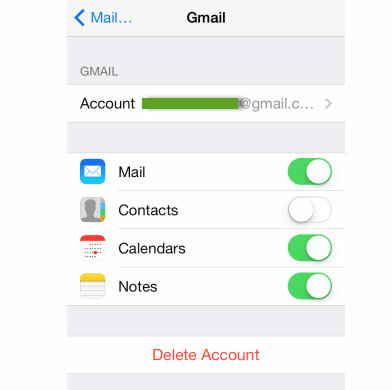 With the help of Google Sync you can sync your iPhone with Gmail. Once you have established a working connection, you will be able to sync your iPhone notes, calendars and contacts with your Gmail account. IMPORTANT: Do note that you can only use this method of your iPhone is running on iOS 4 or higher. If you are not sure if your iOS is capable of this, a good indicator is that you already have Gmail set up on your iPhone. 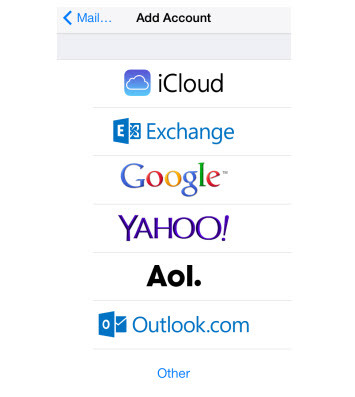 On your iPhone, direct yourself to Settings > Mail, Contacts, Calendars > Add Account. Tap on Google. Enter the necessary information required by the system - name, full email address, password and description. Make sure you enable sync for Notes. Once you have this configured, your iPhone notes should be transferred automatically to your Gmail account under the label Notes. Set up your Google or Gmail account on your new Android device and you should be able to automatically see them in your Gmail app. Now that you have seen it, you know that you can definitely transfer notes from iPhone to Android without corrupting the data. While it may be troublesome, moving them between phones safely is possible. Do note that you can also use these strategies with other types of data on your iPhone. If you are still not sure about getting an Android device after years of using iPhones, we hope this article is able to convince you to take the leap to change from your iPhone to a brand new Android. Want to transfer everything from Samsung S4 to Note 4/Note 3? This article shows you how to transfer data from S4 to Note 4/Note 3 in 1 click. Want to transfer data from Android to BlackBerry? Here we will tell top 2 easy and fast methods to transfer data/contacts from from Android to BlackBerry.